I am amazed. The amount of progress made here is a wonder. We've been going in so many directions this week! Improvements are being made on my art room; I'm already so thankful for the work done to make this room more beautiful. That door I had on my wish list...it's been stained and lightly white/gray washed and soon it will be hung back in the doorway. That is going on plus so much more! I won't complain because it's all such a gift. My parents are visiting and they find major projects to complete while here. They run circles around me, seriously. I'm the multi-tasking manager and overseer of projects in progress so I'm staying busy, too. Having the early evening opportunity to add something here on the blog is a tentative undertaking. I'm not sure how much I'll be able to share before I'm pulled away again. 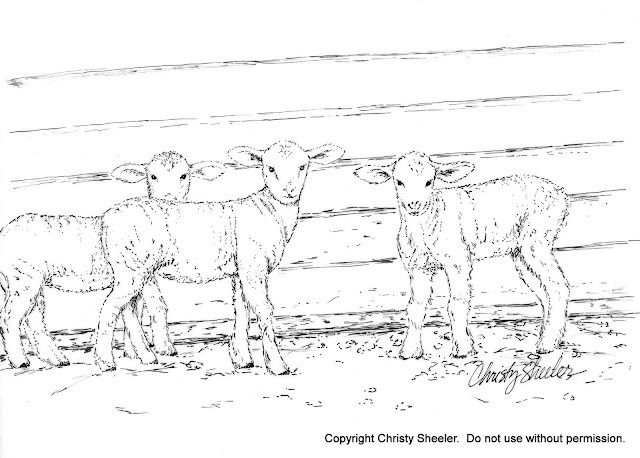 An artwork completed recently focuses on baby lambs. The day I took the reference photos (over a year ago), I was sure it would be a watercolor painting some day. I wasn't sure when the urge would hit to take this subject on. 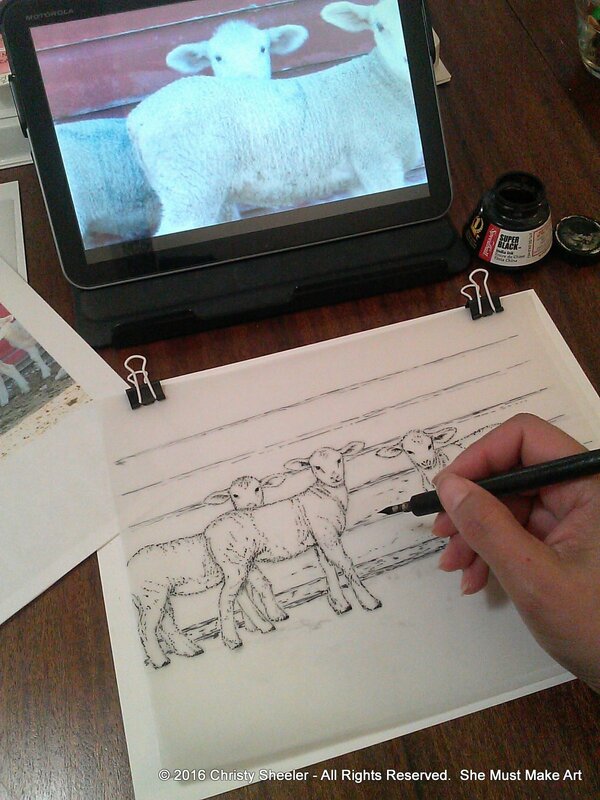 This past two weeks a pencil sketch and ink drawing have been taking shape at my art table. What a pleasure it's been! There's no way of knowing which art works will flow and which will not... It's unexpected. After years of avoiding animals as a subject matter, I may have changed my mind. 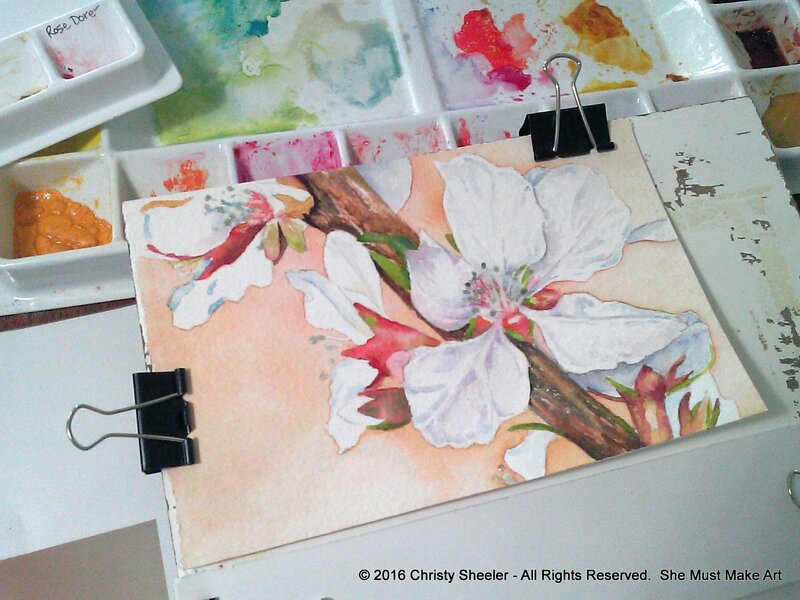 It will be several weeks before the sketch will be ready to begin painting with watercolor paint. 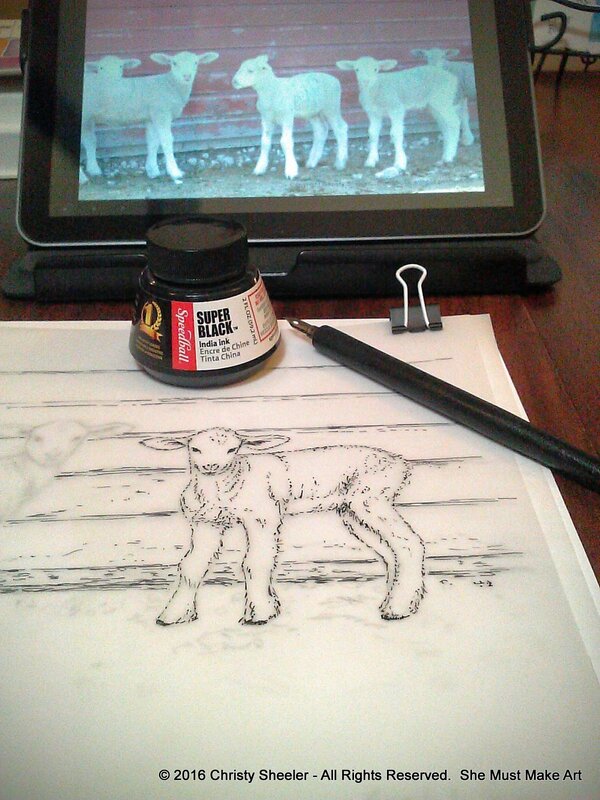 I've been making my preliminary sketches on tracing paper for over a year and it's my favorite way to work. 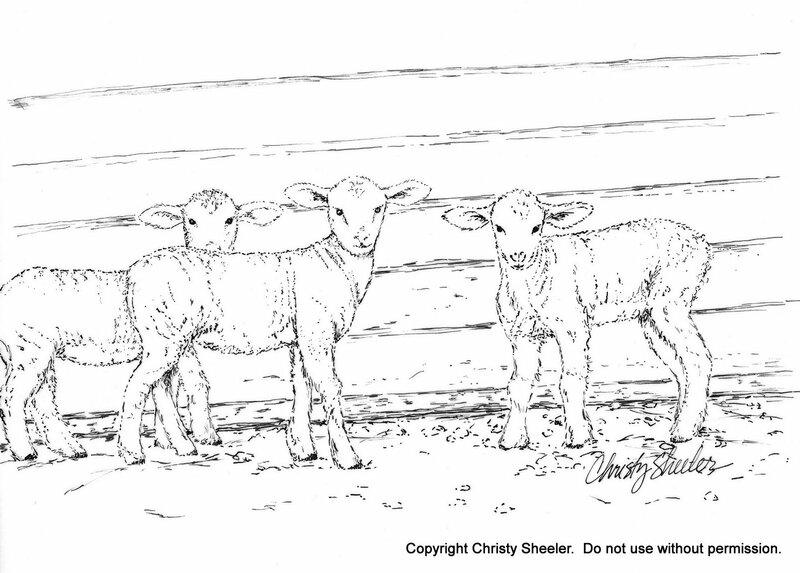 Once the pencil sketch of the lambs was complete, I laid a heavier weight piece of tracing paper over it. The ink drawing was guided by the sketch on the layer below it. The classic quill dip pen and nib with India ink was such a great way to go here! The amount of control and fine details made this a success all the way. The art reference photos were taken at the Snyder place and while telling Susan about them, she lit up! She's the reason for the ink drawing. She made arrangements with me to have the finished jpg image for an invitation she's having printed. I hope to have the chance to share with you how it looks once its been printed! 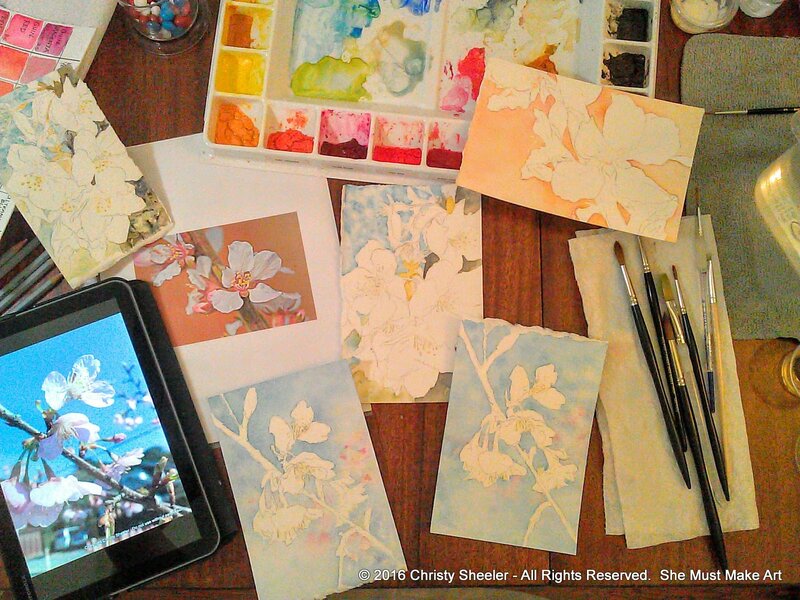 The cherry blossoms watercolor paintings are continuing with much joy in the progress. 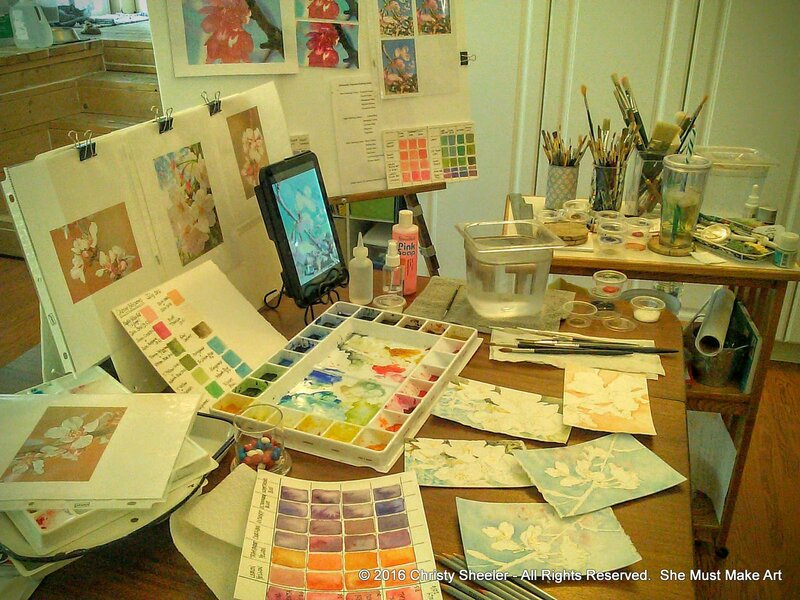 My work space may seem overwhelming but it's all in order, really. Yes, I really do need that many color mixing grids. Yes, I do need that many different watercolor pigments, though I use only a third of what is showing on the tables. 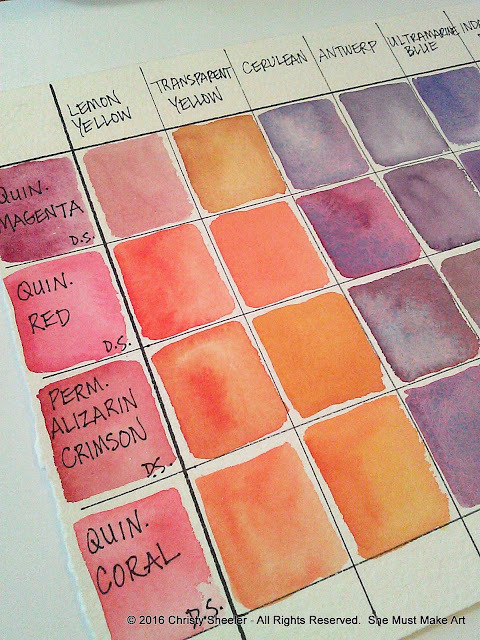 My newest additions to the paints are Daniel Smith and they are wonderful pigments. I wished I'd tried them years ago! I've got five backgrounds done at the present time. I'm working on the details of a single painting this week. A few days ago, I began working on layering in for the branch, leaves and flower petals. 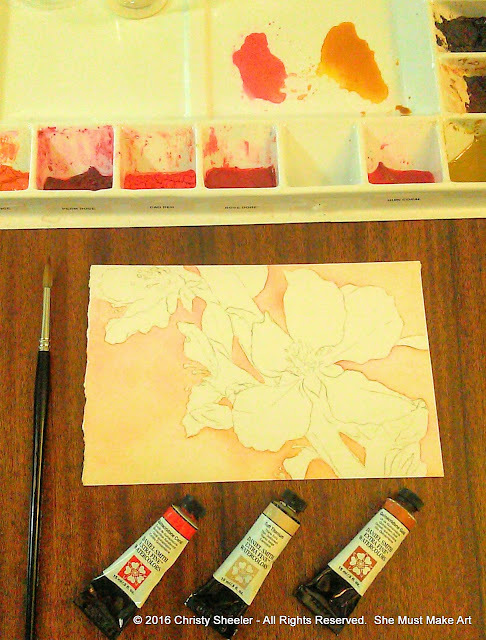 With the application of masking fluid for finer details, the piece is taking shape nicely. It takes great concentration in the beginning stages as I map out areas in the pencil outline. I can easily feel confused about what is flower and what is background! 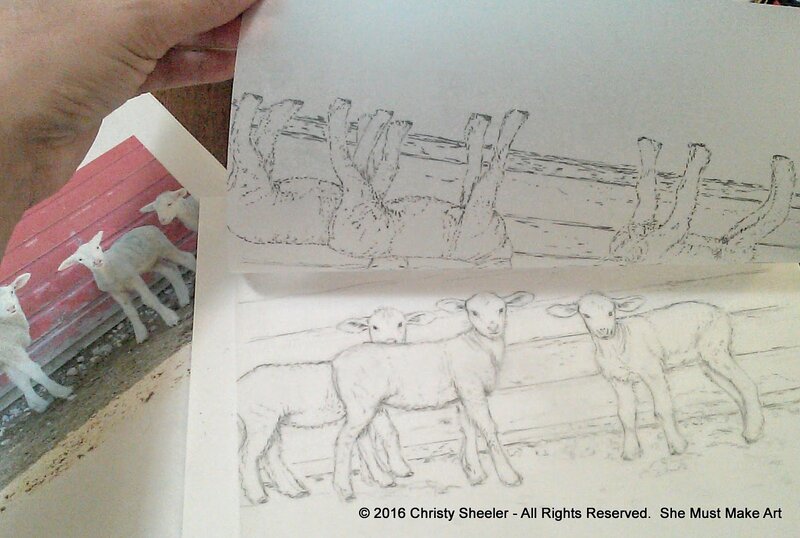 With deep thought, I study my reference photo and lay the colors in from one area to another. I am pleased to share photos of the progression so far! 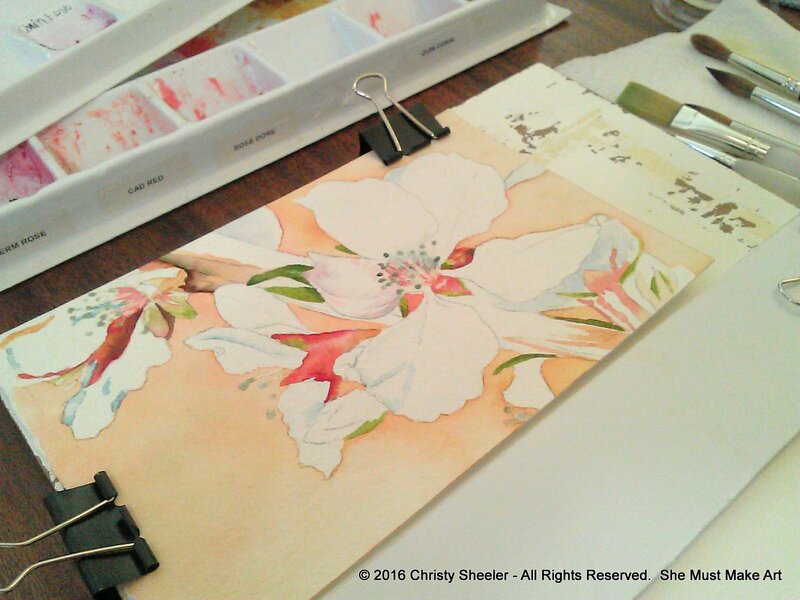 This summer has been a challenge for me to make significant progress in my art room. 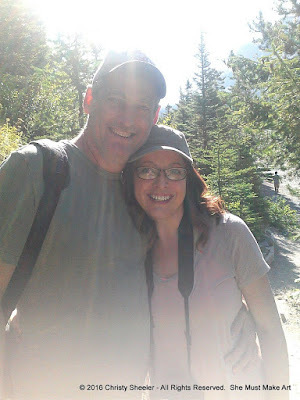 My efforts here on the blog have to be simplified in order to keep up with my weekly posting goal. Persistence and flexibility are key in my daily schedule. So I am still here, making time to be creative on a daily basis, though my hours spent painting are less. Quite a few changes in the art room have already made me look forward to autumn days spent painting with my watercolors! I'm continuing to add new Giclee art prints in the Etsy shop ChristySheelerArtist. Have you checked out my shop lately? 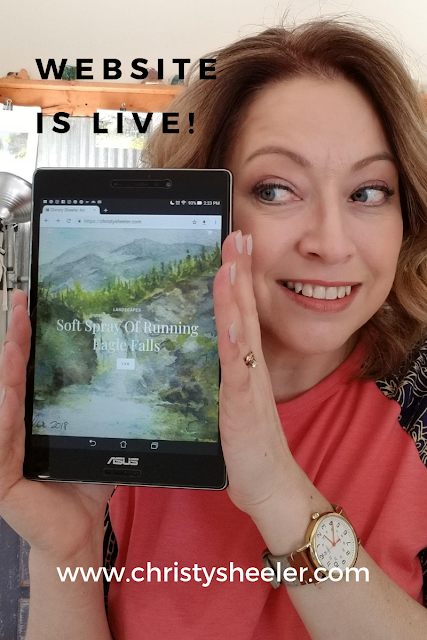 Check out my Contact Page for all my many art related links! There you'll find me on all the various platforms where I share my enjoyment of art...we can trade art tips and secrets! 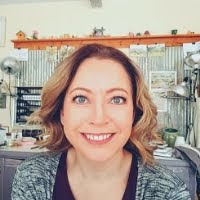 So, for this week...(my weekly posts seem to post later each Thursday this summer) I am Christy, an artist, sharing my artist's journey here, because it's really happening every day. 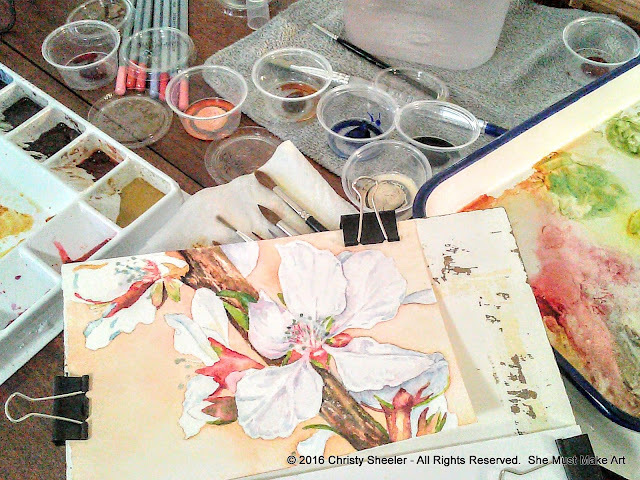 What artistic pursuits are you chasing after, finding ways to make time, making art a part of your days? 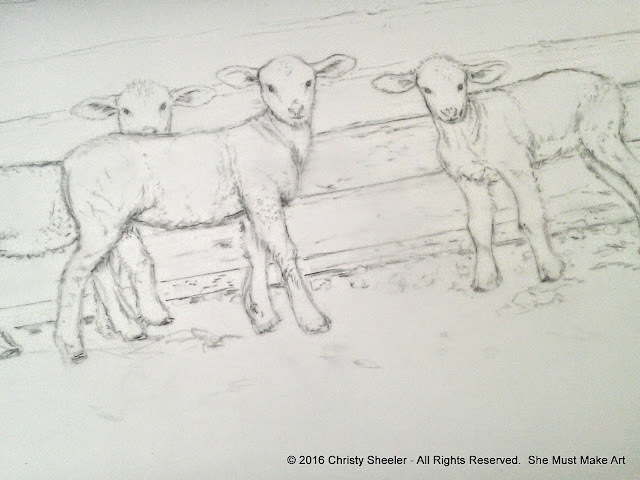 I'd love for you to share here or on my Facebook artist page. Enjoy the summer evenings, the sunsets, the cool breezes! I'm aiming to meet you back here next week...someway or another.